We do natural, ‘Public Relations style’ outreach to good quality sites to obtain links so there are no spammy placements. We also make sure the link is in an article that is highly related to the topic we’re promoting. Having worked in the “men’s pills”, gambling, and pay day loans spaces, we’re confident of delivering exceptional results in almost any niche. When we do white label work we’re almost always up against another contractor. More than 75% of the time we end up with all or most of the business. Even though everyone can guarantee a minimum quality, our AVERAGE quality (by whatever metric you’re measuring) will almost always be higher. That means our links are actually cheaper when you weigh them against results. Think! What would you rather have* 12 links averaging 23 DR or 10 with the same minimum but averaging 33 DR for the same money – remember it’s a logarithmic calculation so 33 is WAY ahead of 23…? We can turn around the first batch of any order, or one-off orders in 4-6 weeks, and for regular customers deliver monthly +/- 3 days like clockwork. I’m personally in touch with all my customers regularly on Skype or by e-mail to update them. No ticket system or impersonal service. * typical stats quoted above are based on old data prior to the AHREFS update and below are based on 80% of the links on any order being in that range. Our typical minimum order size is 5 links. Typical pricing is $197-215/link depending on niche and other requirements. Before the AHREFS update this was our DR40+ 'old DR' tier. Typical pricing $167-179/link depending on niche and other requirements. 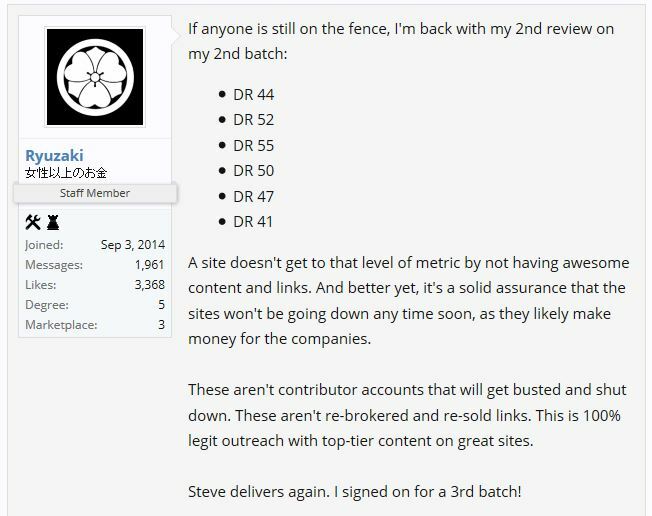 Before the AHREFS update this was our DR33+ 'old DR' tier. Before the AHREFS update this was our DR50+ 'old DR' tier. The complete linkbuilding solution. From content ideas to promotion. We’ll turn your site into a link magnet with beutifully-crafted WordAgents content, then pick up those natural, powerful links you need to rank. Natural links are the cornerstone of building an authority site, but they’re hard to come by. You have to craft beautifully-written content, worthy of being linked to. Then begin the painstaking process of outreaching to potentially interested webmasters to secure those links. Reach Creator Premium powered by WordAgents handles the entire process for you. We generate ideas for premium linkbait content. WordAgents crafts it. All you have to do is post it and we’ll secure high-authority links for you. By crafting a new linkbait for you, every single order of 10 links, we secure authority links spread evenly throughout your site and new content. This is a powerful tool for your interlinking strategy which you can use to drive authority to your sales pages, homepage, and important early-funnel blog posts. 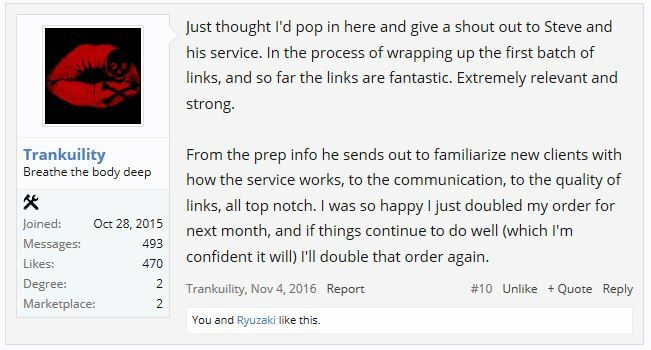 If you already have your beautiful linkbait or authority content ready to build links to, don’t worry – this full service premium offering is optional – we’re happy to take links only orders. Premium sites with DA over 26 and most sites between the ‘new’ AHREFS DR20 and 70. Don’t need a full package with linkbait? No problem, just scroll down for more details of our links only packages and different price tiers. We completed a comprehensive set of outreach to our own PR guide. Not only did we secure links that were all highly relevant and authoritative, we even locked down links from competing PR agencies. Don’t just take our word for it, though, we’ve been getting rave reviews from the folks over at Builder Society for over a year now. 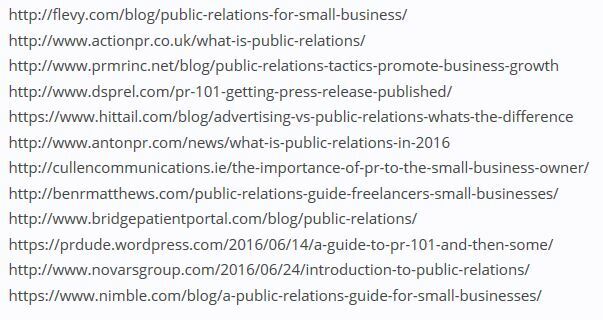 We have blanket non-disclosure with our clients but have promoted our own PR guide to show as samples: (they’re in an image as I don’t want referral traffic from this domain going to them… naturally). Whether you’re a small site with tons of great content looking for just a few links per month, or a large brand looking for a complete content and linkbuilding solution, we’ve got packages to suit your requirements. Our standard tier links are DA20+ (typical CF14+) and come priced at $165 per link typically. We also offer two ultra premium tiers: DA26+ (most CF20+) at $195/link typically and DA36+ (most CF25-40) at $247/link typically in most niches.